Bourgogne wines from the 2015 vintage will be launched in Hong Kong in late May/early June. In the past, importers would have tasted them and shared them with their restaurateur, wine-store, and retail clients. To breathe new life into these exchanges and to provide a showcase for this eagerly anticipated vintage, the BIVB is hosting Bourgogne Week from 27 February to 3 March. 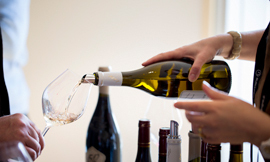 This will be the third edition of what has become Bourgogne Week’s flagship event, at which press and sommeliers can discover wines from the new vintage that will be offered by importers. By invitation only. A prestige evening event featuring the Chablis appellations for media and market influencers. By invitation only. Hong Kong’s wine stores will be promoting Chablis wines throughout the month of March. In parallel, the BIVB is inviting local professionals to organize their own events, such as dinners with Bourgogne winemakers, tastings, and restaurant promotions. It will be promoting all of these events prior to Bourgogne Week Hong Kong in its marketing materials, and in particular on the dedicated www.bourgogne-week-hk.com website, that will be regularly updated. The visibility of these operations will also be boosted by a social media campaign with the hashtag #BourgogneWeek. Follow all the news across the Bourgogne and Chablis wines’ Facebook, Twitter, Instagram, and LinkedIn accounts. Mercurey is one of the Bourgogne winegrowing region’s biggest appellations in terms of production, comparable to Meursault or Gevrey-Chambertin in that respect, and certainly providing enough wine to satisfy markets both in France and beyond. Reds: Often deep in color, tinged with ruby, these wines evoke strawberry, raspberry, and cherry, with a truly fruity bite. Age brings in notes of undergrowth, and spicy touches of tobacco and cocoa beans. In the mouth, they are rich, full-bodied, and fruity. In their youth, the tannins of this wine lend it a mineral firmness. When aged, they are attractively fleshy and rounded. Whites: With hints of green, their typical Chardonnay gold color brings aromas of white blossom like hawthorn and acacia, along with hazelnut, almond, and spices like cinnamon and pepper. A touch of minerality adds to the trademark of these flavorsome, eminently drinkable wines. Reds: Rich and fleshy, Mercurey is Bourgogne wine royalty, providing a hearty structure to accompany a fine steak or any beef or lamb joints, either braised or in sauce. Roast pork is well suited to its aromatic richness, as are stewed poultry dishes and other more exotic-flavored delights. On the cheeseboard, pair it with both soft cheeses and more mature examples. Serving temperatures: 14-15°C for young wines, 15-16°C for older wines. Whites: Their spicy, floral, or mineral bouquets make them the ideal partner for grilled fish or fish in sauce, cooked seafood, Asian cuisine, and hard cheeses. White Mercurey also makes a wonderful aperitif. 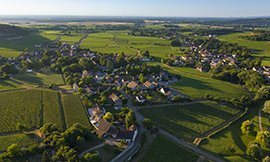 Mercurey is situated in the heart of the Côte Chalonnaise, around 12 kilometers from Chalon-sur-Saône, and is one the biggest appellations in the Bourgogne wine region. Protected from moisture-bearing winds by its hillsides, the region stretches across the villages of Mercurey and Saint-Martin-sous-Montaigu. Mercurey’s AOC status was conferred in 1923. The vines grow at heights of 230 to 320 meters above sea level. They grow on Oxfordian limestone marl and marly chalky soils. The eastern part is on limestone and marl; to the west, crystalline Jurassic rocks are overlain with gravel; and a large part is Bathonian. The vines are truly at home on this white limestone or red clay. Don’t miss the next episode of “Rendezvous with Bourgogne Wines” to find out all there is to know about the origins of the names of the Climats and lieux-dits and how they are related to the wines. The show, which is broadcast in nine countries, offers market influencers a uniquely convivial and enriching experience. 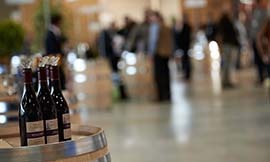 Each edition of the “Rendezvous with Bourgogne Wines” interactive show brings together hundreds of wine professionals around a single appellation or theme relating to Bourgogne wines. The next episode, which screens on 29 March, will be dedicated to the names of the region’s Climats and lieux-dits. This one-hour show helps you expand your knowledge of the various appellations that make up the diversity of the Bourgogne winegrowing region. • The first 20 minutes are dedicated to a themed presentation with reports and interviews with winemakers. • The second part of the show involves a live tasting of six wines, hosted by enologist Jean-Pierre Renard, a trainer at the École des Vins de Bourgogne. Participants are invited to send in their questions to Jean-Pierre throughout the show on Twitter, using the hashtag #BIVBRDV, and he will respond to them live. 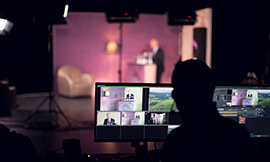 To take part in this interactive training module, potential participants are invited to contact the BIVB’s network of Official Bourgogne Wine Educators, who are tasked with bringing together participants to watch the show together and taste the wines in tandem with Jean-Pierre Renard. Fourteen of the BIVB’s extensive network of Official Bourgogne Wine Educators have already signed up to welcome guests for the next edition of the show, ensuring a global reach to market influencers around the world. The show will be broadcast via satellite in Belgium, Canada, Germany, Ireland, Malaysia, Norway, South Korea, the UK, and the USA, and will screen five times over the day, at 9:00am, 11:00am, 6:00pm, and 10:00pm in English, and at 4:00pm in French (all times are CET). Click here for a list of the BIVB’s Official Wine Educators. The Saint-Vincent Tournante is a major event during the winter in the Chablis winegrowing region, and an integral part of its history. Every year, the event brings together thousands of people to celebrate one varietal and one terroir, so why not join in the fun and put faces to the names of your favorite producers? 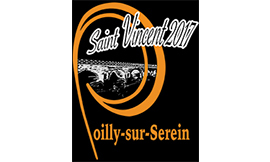 The Confrérie des Piliers Chablisiens brotherhood launched the Saint-Vincent Tournante du Chablisien in 1966. Since then, each of the 19 wine producing villages in the region has taken it in turns to host this celebration that brings together the entire industry – winemakers, laborers, seasonal workers, and pickers – along with the inhabitants of the host village. The event offers the chance for wine lovers to deepen their knowledge of the Chablis appellation through some short videos, covering a range of subjects including its vines, its Climats, terroirs, geology, and its wines. The BIVB is offering a unique training opportunity dedicated to the discovery of the Climats of the Bourgogne winegrowing region through a tasting of a range of AOC Village Premier Cru and Grand Cru wines. Hosted by Michel Jamais, sommelier, writer, lover of Bourgogne wines and Official Bourgogne Wines Educators, this masterclass will bring together Swedish sommeliers to taste wines and thus discover and understand the notion of the Climats that make Bourgogne wines so unique. The Climats were included on the UNESCO World Heritage List in 2015, and are the DNA of the Bourgogne winegrowing region. Created by nature and nurtured by human hand, they are behind the personality of Bourgogne wines. 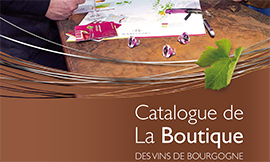 Maps, posters, appellations guides - there is a wide range of educational and promotional materials available in the new catalog from the Bourgogne Wines Boutique. The Bourgogne Wines Boutique offers a vast amount of useful documentation for your articles, and reportages, including maps of the winegrowing area, brochures on the art of tasting, info on the Climats, and guides on many different subjects from aromas to appellations. You will also find a range of objects for serving wine, such as corkscrews, sommelier’s aprons, and champagne stoppers; posters on a wealth of subjects such as varietals, vinification, and the Climats, along with some fabulous gifts including ties, shopping bags, and games for children to share the Bourgogne experience with those around you.